A guitar’s model or serial number can provide you with important information about your instrument, such as the name of the model, the year it was made, the location of the factory and how many of its kind were created. This data is critical for determining the age and value of your guitar, whether it be a hollow-body acoustic style or solid-body electric. You may have a rare and highly-sought collectible, or limited edition, and not even know it – until you look it up. Inspect the guitar’s body for brand markings and serial numbers. 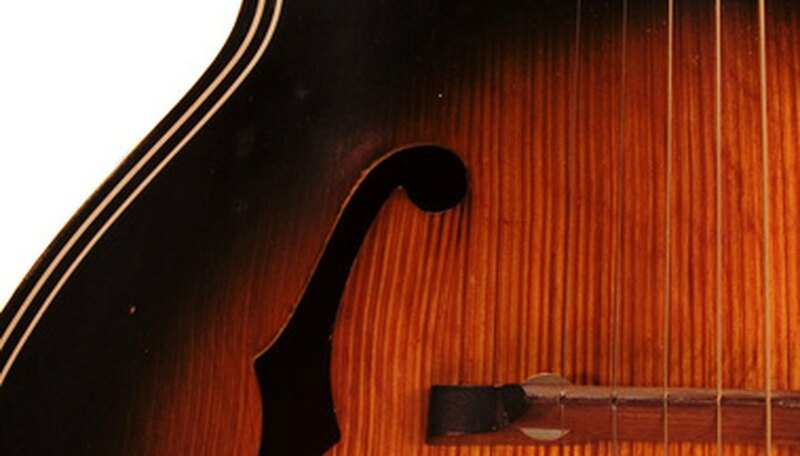 Check hollow body models for a label inside the soundbox that can be viewed and read through the sound hole(s), or numbers engraved on the neck, head or fingerboard. Look on the head and back of the guitar for electric models which often have an engraved plate. Write down the serial number and any other information that you find on the guitar’s body, and keep it handy in a safe place. Go online and check your guitar manufacturer’s website for a serial number look-up link, if you know your instrument’s brand. If this feature is not available, contact the site’s customer support. Contact guitar manufacturers that are not online by looking up their street address and phoning or writing them about your instrument. Use Google or other search engines to assist you with your research. Search through Jedi Star's online "Guide To Guitar Dating," which lists and depicts guitars alphabetically by brand, if you don’t know your guitar’s manufacturer. If you’ve acquired a pre-owned electric guitar and cannot identify its brand or model with certainty, you may have a custom-made instrument assembled from the parts of two or more guitars. Watch out for websites and individuals wanting to sell you paid appraisals. While many assessors are legitimate, an appraisal is not necessary to learn the details about your guitar.